I am currently offering mini sessions in Clovis, NM and Lubbock, TX with 50% of the sales going towards my cousin Luke. My nine-year-old cousin Luke was in a golf cart accident Tuesday, July 28th in Lubbock, Texas that resulted in severe head trauma. Doctors are optimistic that Luke will return home but not without quite the road to recovery with brain damage, a collapsed lung and complications with his left eye due to the golf cart rolling on top of him causing several skull fractures and brain swelling. It is a waiting game as doctors continue to evaluate the extent of the brain damage and the next few days will be key for Tim and Jenny Siegel, Luke's sisters, family, friends and loved ones. Please read here to see more about what Luke is going through and the support of prayer they are receiving. If you are looking to help my cousins in any way as medical expenses mount throughout Tim and Jenny's journey to bring Luke home, please consider purchasing a mini session. 50% of the sales will go towards those expenses. Please pray for the Siegel family as they are living through each day of this hard journey. Want to book a Clovis mini session? These are done on a white backdrop in my studio in Clovis, NM. I am taking sessions from 9 am to 1:30 pm MST. Email me at cristy@cristycross.com to book your mini session, and provide the time you would like for your session. Session fee is due at the time of booking. Once you've booked, I will send more details to help get you ready. Want to book a Lubbock mini session? I am taking sessions from 6-8 pm CST. 7 pm contact me at cristy@cristycross.com to book your session. I mean how cute is this adorable pregnant momma! 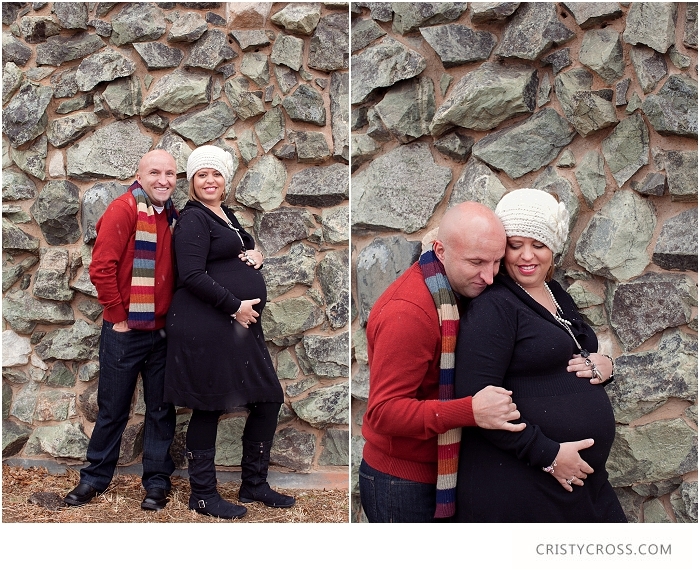 I love the color combo she did too with the forest green cardigan and red plaid scarf.Thanks for coming to New Mexico to let me photograph this sweet moment for you two. I'm looking forward to seeing your beautiful baby. Congratulations to the DeFoor family on their baby that will arrive in 2015. I'm so excited for you all! I am so excited for this family to start their new life together soon. Cox family party of three coming soon! I am loving how beautiful Stacy looks as a preggo mama. Simply gorgeous. More to come. Tricia is due in December and anyone who knows her and her family is so excited to meet this little baby. She is such a beautiful pregnant mamma. Let me also add this makes 7 for her and her hubby, and her baby belly is so beautiful and perfect. I didn't see one stretch mark! Oh, and this also makes 7 boys! How does she stay so girly with all of those boys? :)You are a gorgeous mamma inside and out Tricia. She also collects vintage baby items and has decorated the other baby rooms with the same theme. Some are handed down from family members and others were found in antique stores. The green baby scale was her great uncles, but she bought it at an antique store in California. She found out at the time of buying it that the scale was his, as he was a doctor, and there were two of them like this. The other owner is John Travolta and his wife Kelly Preston. Crazy right! Congratulations to Jason and this beautiful momma, who are the parents of a beautiful two week old baby girl! Christmas Eve started out at a laundry mat for Alicia and Jon's urban Lubbock, Texas maternity photo shoot. It was quite chilly, and then it started snowing. It was so beautiful and perfect. Alicia is due very soon and I'm looking forward to seeing their sweet little girl, Emmy.Congratulations you two! She is almost here. Abby is another beautiful model I photographed for Women's Medical Center. I can't wait to decorate WMC with these fabulous photographs. Take a look here to see our first WMC model. The Women's Medical Center is working on revamping the OB waiting room and patient room, and here is a sneak peek at some of the images that will be displayed. Isn't she lovely.I stayed with Sarah and Thomas last weekend and shot a maternity session for them while I was in Austin, Texas. *I added a few more for Sarah because she asked so nicely.